The “Key Lime Coconut Yogurt Cake” from the June/July 2016 issue of Fine Cooking (recipe below), was a recipe in the right place at the right time. Here’s why: it asked to use the zest and juice from key limes, which were available to me at that exact moment in my food coop. Yippee! A Key lime syrup brushed over this incredibly tender pound cake makes for a delectably moist loaf, while coconut adds subtle flavor and texture without hogging the spotlight. If you can’t find fresh Key limes or bottled Key lime juice, use standard limes. Line a 10x5-inch metal loaf pan with aluminum foil, allowing plenty of overhang on the long sides. Use 1 Tbsp. of the butter to grease the inside of the pan, paying special attention to the short (unlined) sides. Sift the flour, baking powder, salt, and baking soda into a large bowl. Using a fork, stir in the coconut and zest, evenly distributing any clumps. In the bowl of a stand mixer fitted with the whisk attachment, or using a hand mixer, whisk the remaining 10 Tbs. butter and 1 cup of the sugar on medium speed until pale, scraping down the bowl occasionally with a silicone spatula, about 5 minutes. Reduce the speed to low and whisk in the eggs one at a time. Whisk in 1 Tbsp. of the Key lime juice. (The batter may appear slightly curdled.) Add half of the flour mixture and mix briefly on low speed until incorporated. Add the yogurt and mix briefly on low speed until incorporated. Add the remaining flour mixture and mix on medium speed until the batter is smooth, about 1 minute. Scrape into the prepared pan and bake until a skewer inserted in the center comes out clean, 55 to 65 minutes. Meanwhile, combine the remaining 1/4 cup sugar with 1/4 cup water in a small saucepan. Bring to a boil over medium heat, stirring constantly, until the sugar dissolves. Boil one minute. Remove from the heat and add the remaining 2 Tbsp. Key lime juice. Cool until needed. Place the cake pan on a rack. Poke all over with a cake tester or toothpick. Brush liberally with all of the lime syrup, pausing occasionally to let it soak in. Let cool for 15 minutes. Lift out by the foil and finish cooling completely before removing from the foil and slicing. 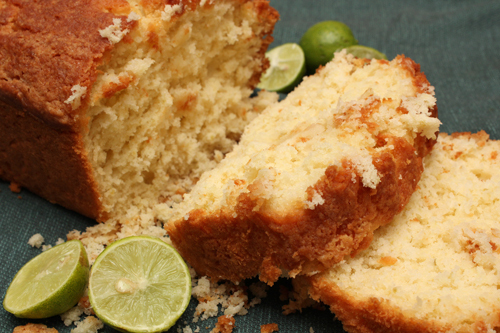 I used seven of the ping-pong-ball–sized limes for this cake. Was this a hassle? Not really. We can do this. Key limes may indeed be “less tart” than other limes, but there’s so much sugar and sugar syrup in this cake, the tartness isn’t a factor. In the oven, the cake rose up like a pound cake. It needed to bake for 75 minutes. Indeed “delectably moist,” this tasty cake was crumbly, sweet and syrupy. I was a winner with this one. Next time, I want to build a salad. The “Freekeh with Grilled Tofu and Miso-Lime Dressing,” from the August 2016 issue of Food & Wine, will let me use furikake (and more of my key limes!). Come back to my site next week, to share this with me.